Jamie Bianchini needed a lift. A big one. After a series of spectacular business flops drove him into bankruptcy and the love of his life kissed him goodbye, Jamie knew he needed a world of help. But instead of seeking assistance from a counsellor or support group, Jamie sought comfort where he’d always found it…on his bicycle. As his world hit rock bottom, Jamie hatched a crazy plan that just might make everything right. His life lacked purpose, passion, and connection with his fellow man. So Jamie decided to go for a bicycle ride…around the world…on a tandem…solo…inviting everyone he met to join him for a spin. 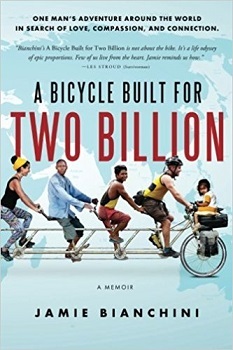 A Bicycle Built for Two Billion is the moving story of an audacious optimist who tried to change the world – while hoping the world would change him – one rider at a time. A heartfelt, hilarious, adrenaline-fuelled journey through 81 countries, A Bicycle Built for Two Billion will allow you to see the planet in a way never experienced before. 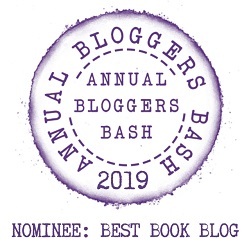 Come join Jamie and his unforgettable cast of co-pedalers – from inspiring villagers to conniving thieves, romantic paramours to unlikely gurus, excited school kids to seniors who have never set foot on a pedal. Come join them all for the ride of your life. Includes nearly 200 spectacular photos and videos captured around the world, bringing this rich story to life. I would happily recommend this book to any one with an interest in travel and bikes. As a closet hippy the concept of peddling round the world on a tandem giving strangers a lift, spreading love, peace and tolerance changing the world one ride at a time is just my thing. But, it turns out that Jamie and the west are more in need of love and tolerance than the people he is supposed to be helping. The book is written as a diary. Initially his story lacks organisation darting from one disaster to another (I feel a good editor could have sorted this out). The short chapters make the book easy to pick up and put down. Each chapter ends with lots of pictures, and a link to his many short movies; That interaction was quite novel for me. It made it more personal and I felt I could recognise Jamie and his friends. It was also overtly commercial, asking you to join the club and support his charity endeavours. American I guess? Jamie writes with brutal honesty about his failures, how his life had fallen apart due to poor judgement and selfishness. He candidly charts his emotional development across the continents, through more failed relationships interspersed with depression and self criticism. I have to say many of his choices and thoughts make it difficult to like him as a person, but he is saved by his honesty and real attempts to rectify his failings. I found this part of his journey quite inspiring, as it made me question the assumptions I make about other people. The sort of thoughts that only a collision with another culture make you realise. I was also a little envious of the fact that Jamie had had real life adventure, of the sort I would love to embark on but could never actually dare. After a less than ideal childhood Jamie was voted “Most Likely to Succeed” in High School. He then went on to graduate college with a Best Business Plan award from USC’s world renowned Entrepreneur Program in 1995. Even with what appeared to be great potential for success, Jamie drove himself to hitting rock bottom in his late 20’s. He fell into the trap of thinking that life was all about him, getting what he wanted at any cost, and getting it as fast as possible. It was not until he lost it all – money, love, relationships, and health – that he realized there had to be more to life. Since then, he’s been on a journey to discover humility, foster compassion, find his purpose and live authentically. He’s fallen on his face more times than most in the process, but each time he gets back up, and he seems just a bit wiser for it. Jamie lives with his wife and two children in Santa Cruz, California. For the past four years they have been working together to prepare and share the stories of this journey with the world.